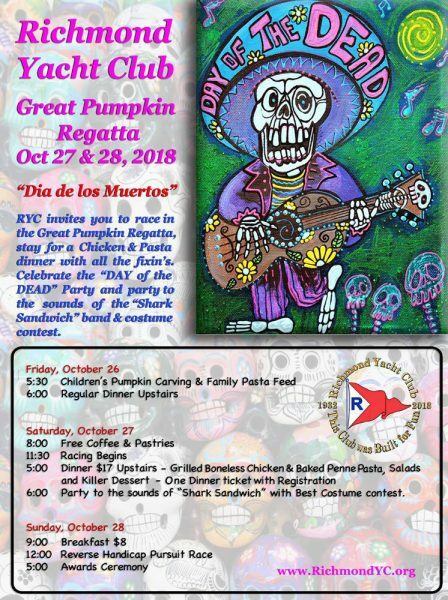 Costumes, light air and sun defined Del Rey Yacht Club’s 2018 Halloween Monster Mash Regatta. The race was held Saturday, October 20, on the Santa Monica Bay Olympic Circle. The picture-perfect winds that prevailed in September gave way to Santa Anas, high 80+ temps and doldrums. At least the seas were flat. It was like summer out there. The near zero-knot winds prior to the 2 p.m. inverted start gradually built to ‘enough to sail’ for all but two of the 18 entries to finish the 8.8-mile course. 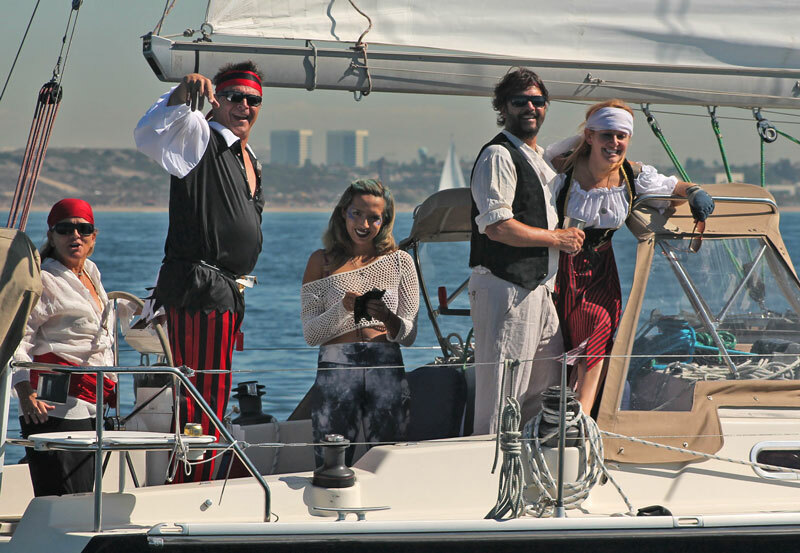 The pirate crew of the Hanse 371 Cassiopeia. This event is unique in that competitors have the option of crossing the start line in either direction as long as they pull a virtual string that circles all the marks of the course, and there are six, not including the starting line, which has to be crossed twice. There was a near-equal division of starters between those who chose to go to weather or downhill. The race committee broadcast start times, and Ron Jacobs’ Catalina 42 MkII Duchess was caught over early in the extremely light air, bringing peals of laughter from the other racers, but he cleared the line, reversed his start and recovered nicely. 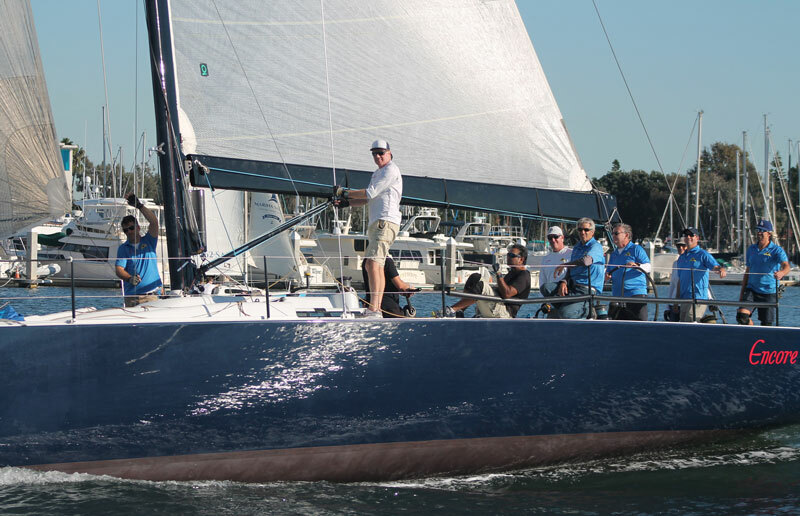 John McIntire’s TP 52 Encore pulled a horizon job on the whole fleet and finished eight minutes ahead of second-place John Staff, despite starting nearly 20 minutes after the next-to-last starter. The boats ranged in size from a C&C 25 to the 52. How big is she? Encore is so big she didn’t fit in the camera frame. 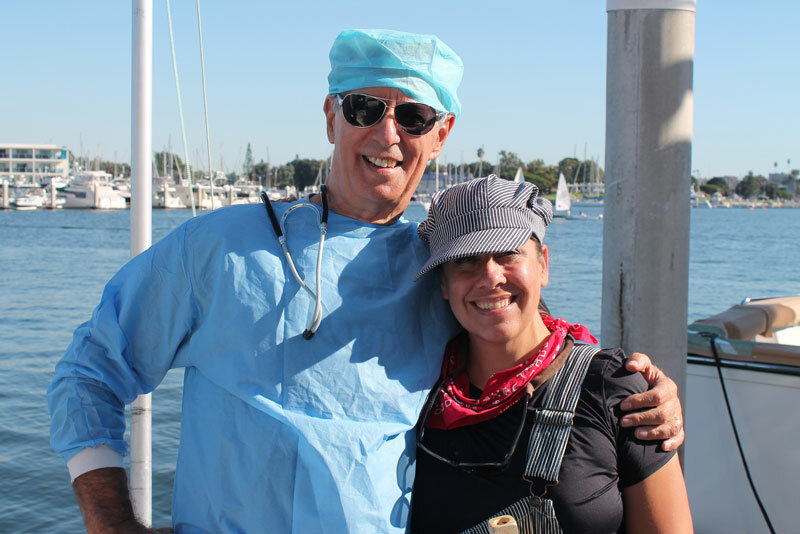 In anticipation of November’s Women on Water/Woman at the Helm events, many boats had female drivers and did very well. The ‘doc on the dock’ was race chair Andy Kopetzky. The train engineer was race committee volunteer Janet ‘J Zee’ Zander. 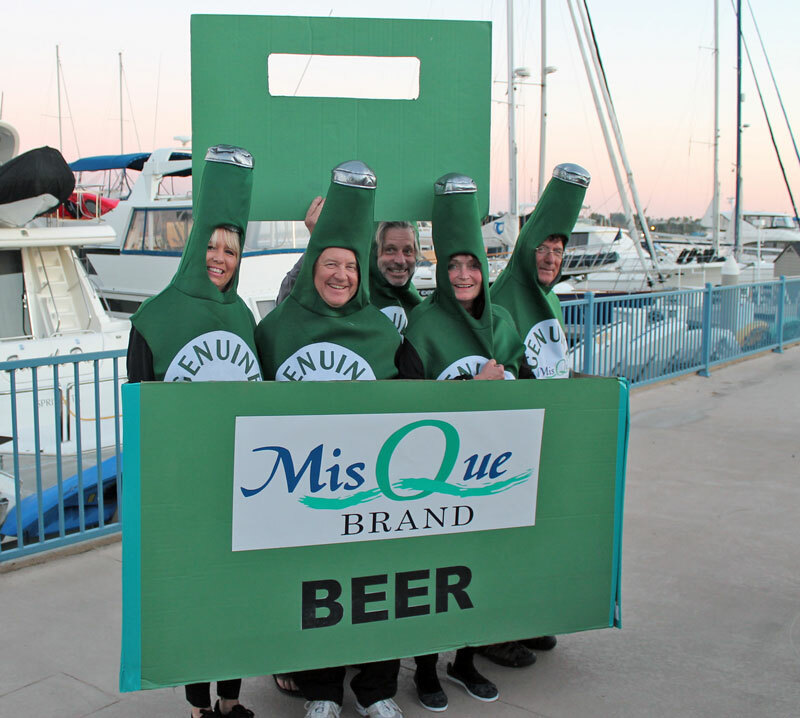 The post-race party featured a chili bar, raffle and awards for best costumes both on the water and on the patio. Jerry and Lea Kaye and the crew of the C&C 25 MisQue wowed the party when they changed clothes and reappeared as a six-pack (minus one) of MisQue beer complete with carton. Hey! There’s one missing from this six-pack! This has traditionally been a fun, informal race, and all the competitors had a great time. Results are at www.dryc.org/racing. Hurricane Willa underwent an expected weakening as it approached the Pacific Coast of Mainland Mexico yesterday, but made landfall packing 120 mile-an-hour winds, and forcing the evacuation of approximately 4,000 people from coastal towns, according to CBS News. 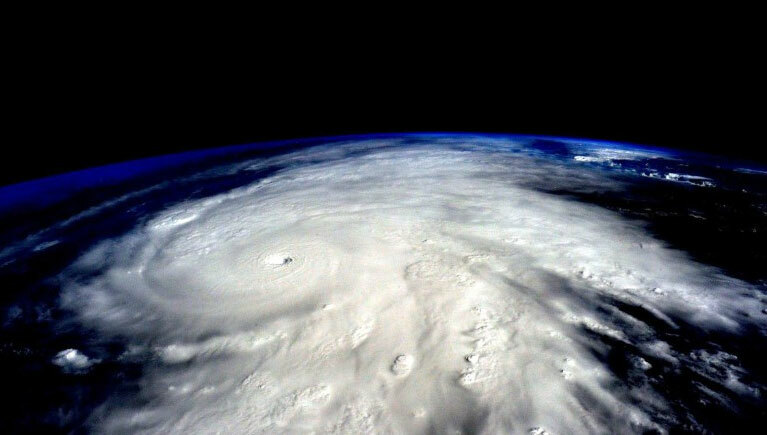 Now a “fierce” Category 3 hurricane, Willa is marching across interior Mexico and heading toward the US, “where it could spawn the first nor’easter of the year,” according to CNN. It’s not yet clear what damage was done by Willa, but to the south, Tropical Storm Vicente claimed at least 12 lives in Southern Mexico. In Mazatlan, the beach was said to have “almost disappeared, with waves slamming against the coastal boulevard,” according to CBS. The full extent of damage to this part of the coast is not yet clear. And don’t forget about Tropical Strom Vicente, which has reportedly claimed some 12 lives in southern and southwest Mexico with floods and mudslides. As Willa continues to head northeast, Texas is now in its crosshairs, where the storm is “forecast to dump up to four inches, with more than 4.4 million facing flooding threats,” reported CNN, before the storm moves into the already-saturated Southeast. “In Willa’s dramatic finale, remnants of the former Category 5 hurricane will move into the Atlantic Ocean and get a startling makeover this weekend.” Meteorologists said that if the low-pressure leftovers of Willa track up the East Coast, they could become the season’s first nor’easter, bringing rain and wind on Saturday and Sunday to Washington, D.C., Philadelphia, New York City and Boston. 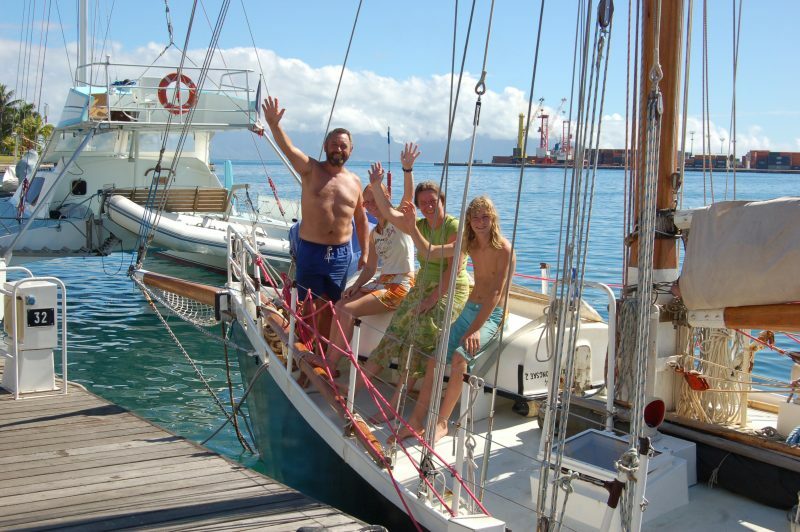 The SoCal-based Herreshoff ketch Rhapsody makes landfall in the Society Islands. What the heck is the Pacific Puddle Jump? It’s a long-established annual migration of cruising sailors from various ports along the West Coast of the Americas to French Polynesia — an ambitious bluewater crossing of 3,000 to 4,000 miles. Ever since we coined the phrase Pacific Puddle Jump more than 20 years ago, we’ve taken pride in organizing this loosely formed rally, and reporting on the colorful characters who register with the PPJ each year. Typically, more than 200 boats sign up from all over the world. 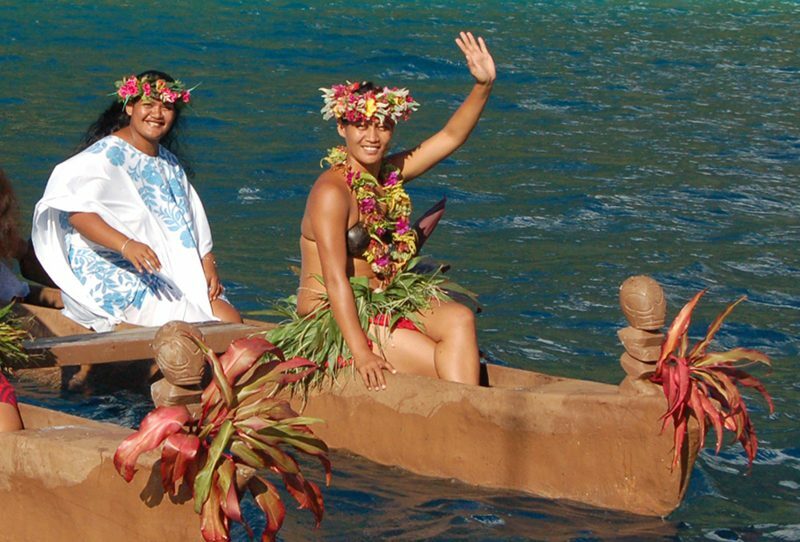 Although you may not be greeted upon arrival by a boatload of Tahitian dancers, you’ll find that Polynesians are generally super-friendly people. We’ll co-host several PPJ Send-off Parties again this year: March 4 at the Vallarta YC in Nuevo Vallarta, Mexico, plus two events in Panama in February (dates and details TBA). 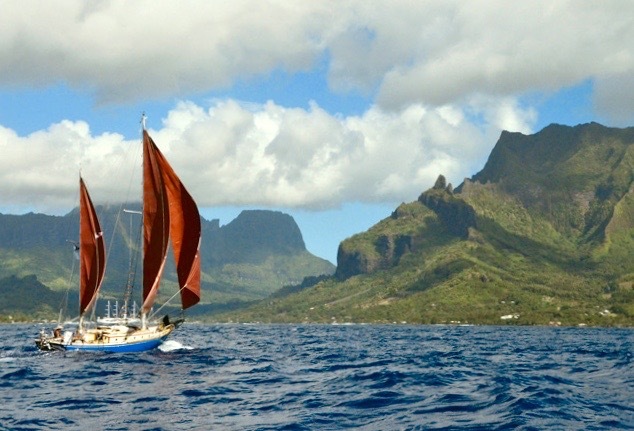 Then in late June, we’ll join these passagemakers in celebrating their successful arrival in the islands at the annual Tahiti-Moorea Sailing Rendez-vous (June 21-23). Some have referred to doing the Puddle Jump as a must-do adventure for cruising sailors. Perhaps because it tends to combine challenges of self-reliance with glorious offshore sailing. What do you say? Will 2019 be your year to ‘jump the puddle’? Sailors should know better than to expect wind just because they’ve planned a big weekend of racing. And they do. For last weekend’s Extreme Sailing Series, race villages were set up, boats were tuned up and sailing fans appeared along the shore despite a shortage of wind to help the speedy MC32 cats leap onto their foils. Regardless, Kim Dumas of West Coast Multihulls reported that the shoreside race village was lively and even this slower event was keenly competitive (like golf and curling) as the international fleet of seven teams duked it out close to shore in this sixth event of the seven race 2018 series. The American team Element Sports was the newcomer when they joined the series in San Diego. Over four days of racing in light air off the shores of Harbor Island, viewers could relive some of the drama that’s come with past high-stakes competitions visiting the ‘Big Bay’. 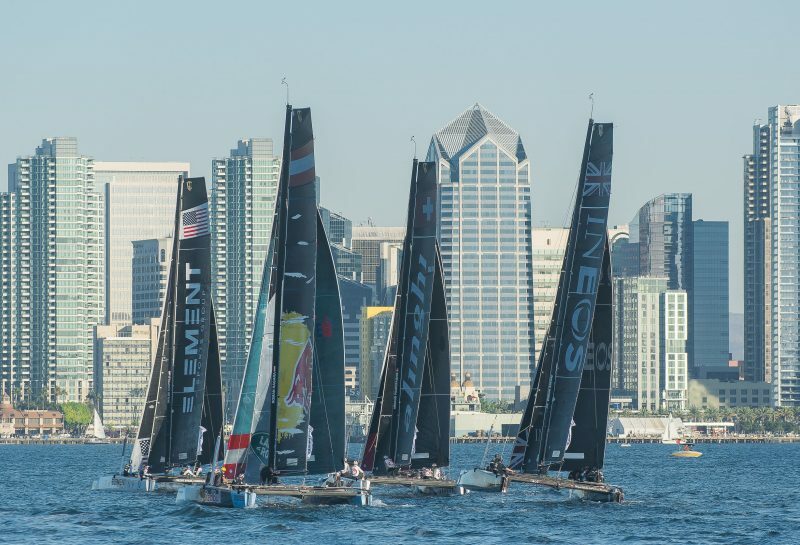 In the past, San Diego Bay has played host to numerous grand prix events like the America’s Cup, RC44s and the AC World Series event in AC45s. 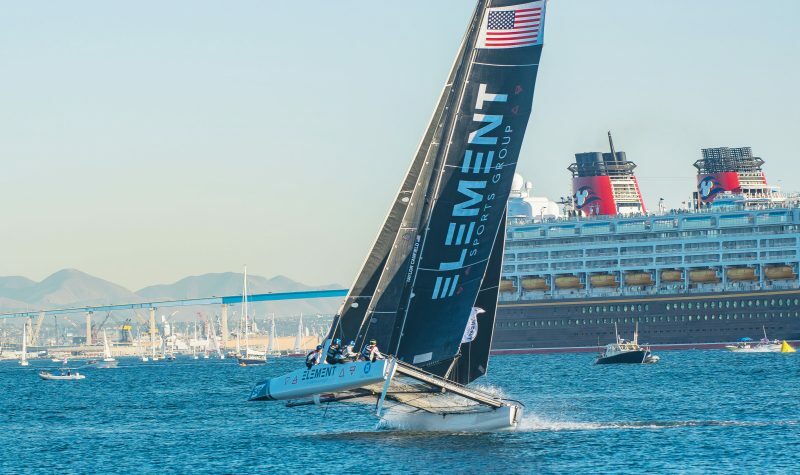 With the arrival of the Extreme Sailing Series San Diego adds a foiling fleet to the growing list of West Coast foiling events. 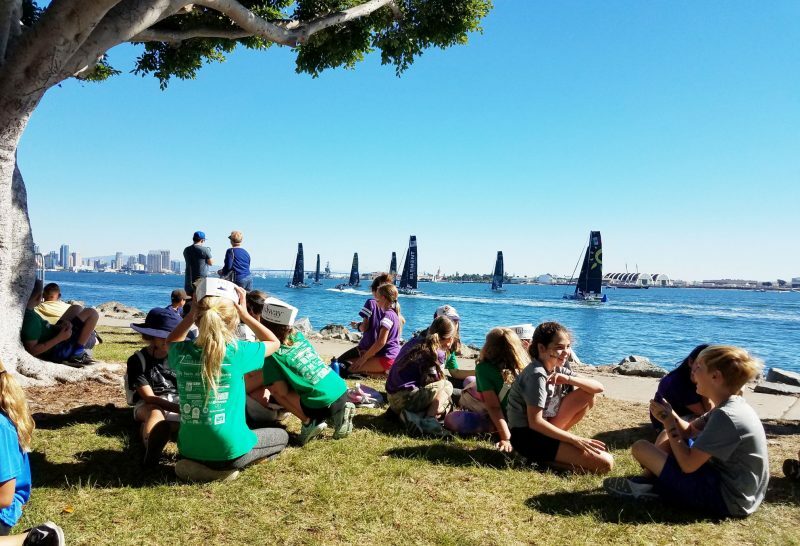 Plenty of kids caught a glimpse of the high-tech racing from the sunny, Harbor Island race village. With 21 races over four days the seven teams struggled to get their boats up in the flaccid conditions yet that doesn’t take the edge off the rivalry. Overall series leader Alinghi was overcome by Oman Air team who took the event victory with a close-fought second-place finish in the final race to secure the win over Alinghi. Element Spark Compass (USA) with Taylor Canfield, Sam Hallowell, John Wallace, and Californians Matt Noble and Mateo Vargas, ended up sixth. Team México (MEX) lead by Erik Brockmann with Tom Buggy, Alex Higby, Tom Phipps and Danel Belausteguigoitia Fierro, finished up in seventh. Alinghi remains the 2018 series leader. Tight fleets of foiling cats battled it out mostly in displacement mode. The next and final stop for the Extreme Sailing Series is Cabo San Lucas on November 29-December 2. Team Mexico is hoping to move up the ladder while they also look to bring more attention to sailing in Mexico. Cabo San Lucas, the home of fishing tournaments, vacation revelry, Cabo race destination and a Baja Ha-Ha/cruisers pit stop will add a grand prix race circuit to its waterfront menu. Since the 2013 America’s Cup on the Bay foiling has skyrocketed and hitting the mainstream with the West Coast clearly on the circuit. Foiling kiteboarders and kite pro tours regularly hit the Bay, the Extreme Sailing Series is in its second year in San Diego and Mexico and, arriving in San Francisco in May, the SailGP circuit will add the fastest and newest of the foiling circuits to the West. California has long been leading edge of high tech in aerospace foils so it’s no surprise this is showing up on our waterfront as well.